This Bacon Wrapped Asparagus blends the amazing flavors of fresh asparagus, glorious bacon, and parmesan cheese. Just a little prep time and very little grill time delivers this scrumptious side dish or appetizer! You can eat it steamed, roasted, sautéed, and even raw, but we love ours grilled with a little Parmesan and olive oil, and maybe even finely grated Monterey Jack. When I met my husband, we discovered that we both loved big breakfasts with bacon, but oddly, we hardly ever ate bacon! I used to have it once a year or so, when my dad cooked it in the oven for Christmas brunch. Lacking bacon in our lives, we made a vow that when we were finally living together, and not 3,000 miles apart, we would find new ways to eat bacon together. I’m happy to say we do! Our Bacon Wrapped Asparagus recipe requires a little bit of prep, and only a little bit of cooking. Once you get the hang of wrapping the raw bacon around the asparagus, each one gets easier. And once you get the hang of the delicate balance of knowing how to cook the bacon through, without letting the asparagus burn, it works perfectly. We were surprised at how good it was the first time we bit in to this recipe. It’s a family favorite now. Place asparagus on a sheet of waxed paper and brush with olive oil. Sprinkle asparagus with pepper and turn it around to coat the other side. Cut the bacon in half - and aim to cut as much of the fatty part off as possible. The fatty pieces of bacon don't cook as fast. Wrap your non-fatty bacon piece around and around a stalk of asparagus. Secure both ends with small toothpicks, careful not to knock the head of the asparagus off with toothpick placement! Grill uncovered over medium heat for 4-6 minutes on each side, until the bacon is cooked through and crisp. Sprinkle with cheese at the end. Home Chef Tip: Cut the bacon in half with a sharp knife or scissors - and aim to cut as much of the fatty part off as possible, choosing to wrap the asparagus with the non-fatty parts. The fatty pieces of bacon don't cook as fast, and since asparagus cooks faster than bacon to begin with, you want the cooking to be as even as possible. The cheese is optional, of course, but I love the flavor it adds. We generally use Parmesan, but last time we wanted to make this recipe for dinner guests, so we decided to try something new. With the tender asparagus and crisp bacon, this is soon to be a crowd or party favorite. I was surprised at how successful it was, but when you factor in two strong and popular ingredients, it’s no wonder this recipe is such a hit. I consider it to be filled with the flavors of summer, and I know I will still be dreaming of it, long after summer has ended. With fall soon approaching, I will have to find a way to combine bacon and asparagus into a cold weather meal too! 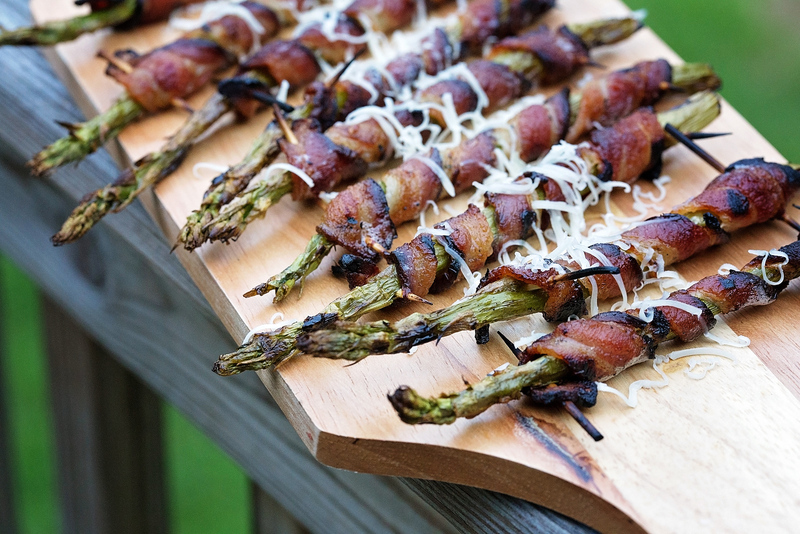 We hope you love this recipe for Grilled Bacon Wrapped Asparagus from SoFabFood Contributor, Tamara from TamaraCameraBlog.com, as much as we do. If you enjoyed this recipe, be sure to subscribe to our newsletter so that you’re always ready for game day. For daily recipe inspiration, like us on Facebook, follow us on Pinterest, and stop by our Google+ Community to see all of the amazing recipes our community members are sharing. Enjoy!